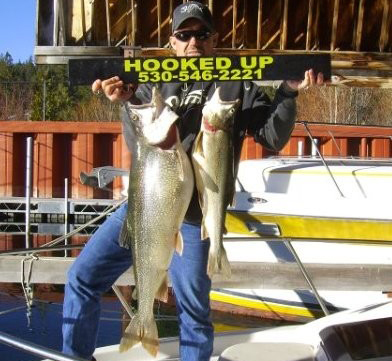 Hooked Up – Lake Tahoe Sport Fishing – Come get hooked up! Hooked Up is owned and operated by Hans Moxley. Hans has been fishing Lake Tahoe for over 15 years; a true Lake Tahoe fishing expert. While fishing Lake Tahoe aboard our trophy fishing boat you will be served free sodas, water and other assorted beverages. Hooked Up Lake Tahoe does our Lake Tahoe fishing from aboard a 2006 24′ Trophy Fishing Boat. When fishing Lake Tahoe we troll deep, at an average depth of 200′ using Scotty Electric down riggers, fish finders, GPS, & radar. For Lake Tahoe fishing we use Abu Garcia reels with 8.5′ Lamiglas fishing rods. Tackle and gear are included. The boat holds two to six passengers and is perfect for your Lake Tahoe fishing charter needs. 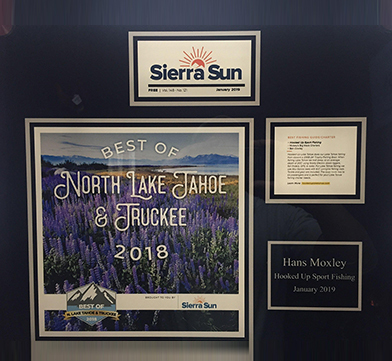 By popular vote, the readers of the Sierra Sun have voted Hans Moxley of Hooked Up Sport Fishing the WINNER of the 2018 “Best Fishing Guide / Charter”! Hooked Up Sport Fishing was also rated NUMBER 1 in the 2018 TRIP ADVISOR category for best fishing charter! Fishing Lake Tahoe has never been more fun! 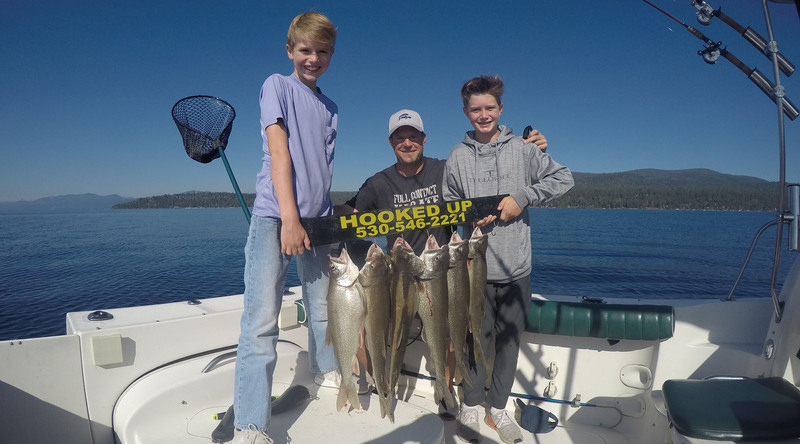 Lake Tahoe fishing charters are provided by Hooked Up Sport Fishing. We are fishing Lake Tahoe for Mackinaw, Rainbow and Brown Trout as well as the occasional Kokanee Salmon. 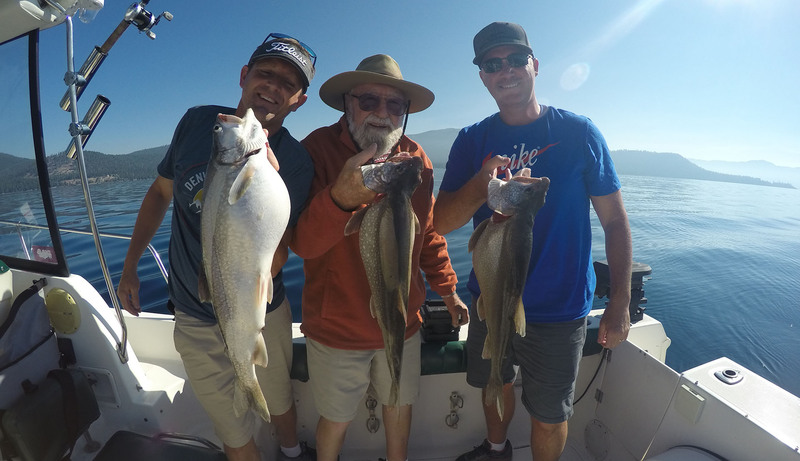 Our Lake Tahoe fishing charters leave from Carnelian Bay and stay out on the water for approximately 5 hours at a time. Our Lake Tahoe fishing trip departure times vary according to seasons so please call for current departure times. 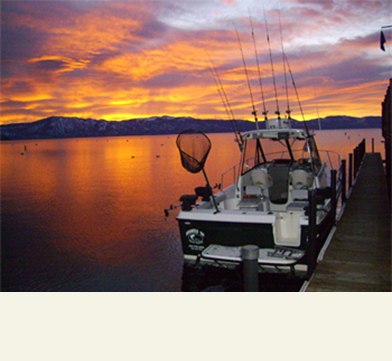 We offer year round lake tahoe fishing with morning and afternoon trips. Description: The body, dorsal and tail fins of most Lakers are brown or dark green and liberally marked with white or yellowish spots. The other fins are usually unmarked and lined with white. 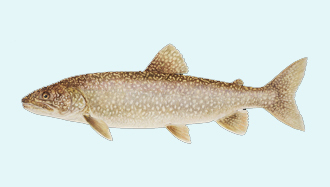 Size: Recorded to more than 100 pounds, the Lake Trout usually runs from about 5 to 30 pounds, occasionally topping 60. World record 72 pounds. Game Qualities: A strong fighter. Description: Browns are tan to brown or pale yellow on the sides and plentifully sprinkled with black, brown and red spots on sides and gill covers. Size: Although the world record is 40 pounds, the average size is 1 or 2 pounds and a brown trout over 4 pounds is always a prize. 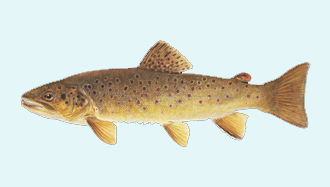 Game Qualities: Considered the toughest of Trout to fool with flies. They are also strong and determined fighters than can uncork some wild jumps. 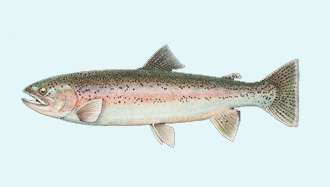 Description: As with other Trout, color can vary from one body of water to the next. In clear lakes such as Lake Tahoe, fish may be almost colorless but most mature Rainbows do have a characteristic broad, red slash from head to tail. The body is gray-blue or olive above the lateral line, silvery below. Sides, dorsal fin and tail are dotted. Size: A good rule of thumb is: the bigger the water the bigger the Rainbows. 2 to 4 pounders are common in larger lakes and specimens exceeding 5 pounds are not rare. In fact, Rainbows over 20 pounds are taken in big water. World record 42 pounds, 2 ounces. Game Qualities: A favorite of fishermen and with good reason. Rainbows combine exceptional strength with a flair for showy jumping. Description: Blue back, silver sides, small dots on back and tail. Breeding males develop red sides, female dingy black sides. 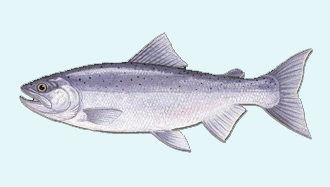 Size: The Kokanee is a dwarf landlocked form of the anadromous Sockeye. Typically, it runs about 8 – 12 inches long. A 2-pounder is a big one, and the maximum weight is possible 5 pounds or so. Game Qualities: What a sport fish lacks in size it must make up for in number and cooperativeness, and Kokanees are up to the task. Although their natural food is virtually all plankton, they nevertheless will take a variety of small baits and fight well on light tackle. $100 per person, discounted rates for children. 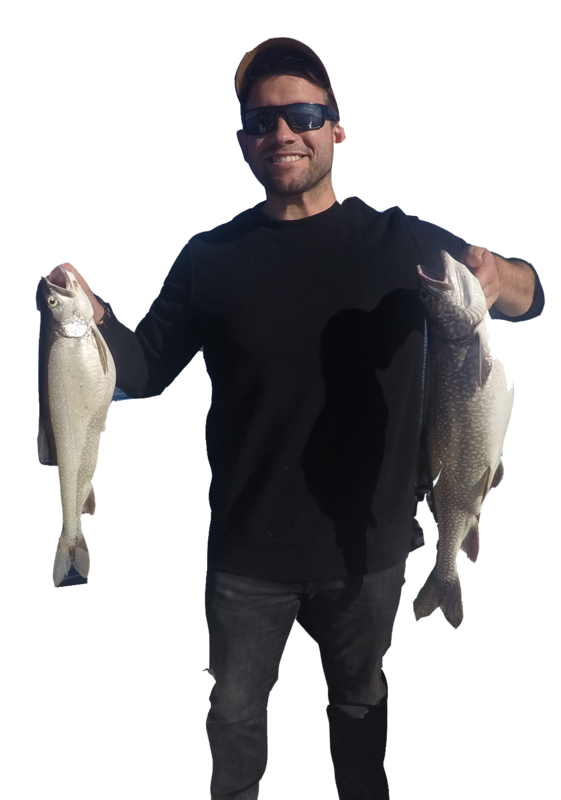 Purchase your CA fishing license here. Please secure your reservation with any major credit card. Booking your trip confirms acceptance of our cancellation policy. Cancellations within 72 hours of the trip are non-refundable.